Fancy colored diamonds are gaining more and more mainstream popularity every day. But while you may be familiar with the look and emotional ‘feel’ of pink, yellow and even blue diamonds, if you are a fan of colored diamonds have you ever considered gray diamonds? Some people do tend to associate the color gray with drabness and boredom. But that is only one side of the color. From a color psychology perspective, gray is the color of compromise – being neither black nor white, it is the transition between two non-colors. The closer gray gets to black, the more dramatic and mysterious it becomes. The closer it gets to silver or white, the more illuminating and lively it becomes. And that is certainly true when it comes to gray diamonds which, although you may only just be learning about them here can be some of the most stunning and unique colored diamonds of all. How are Gray Diamonds Created? Like their reasonably close cousins blue diamonds, gray diamonds are believed to be created when they come into contact with the elements hydrogen, nitrogen, or boron during their long formation period. This interaction produces diamonds in all different hues and intensities of gray and many gray diamonds also boast gorgeous secondary colors that make them even more beautiful and unique. Where are Gray Diamonds Mined? Like all colored diamonds gray diamonds vary in hue and intensity. Their intensity varies from faint to fancy dark and you can also find gray diamonds that have vibrant secondary colors. When you shop for fancy color diamonds, including gray diamonds, when working with a reputable diamond broker you can shop for the diamond alone and then choose later how it is set. A ring is what perhaps springs immediately to mind, but that would be far from your only option. Because gray diamonds have such a distinctive, commanding appearance they make fantastic statement jewelry. Every woman who loves jewelry normally has one of those. A brilliant, wear everywhere necklace, a stunning pair of earrings, part of a stunning diamond bracelet can all make great signature pieces that help define your style and grey diamonds would be perfect for use in any of those. 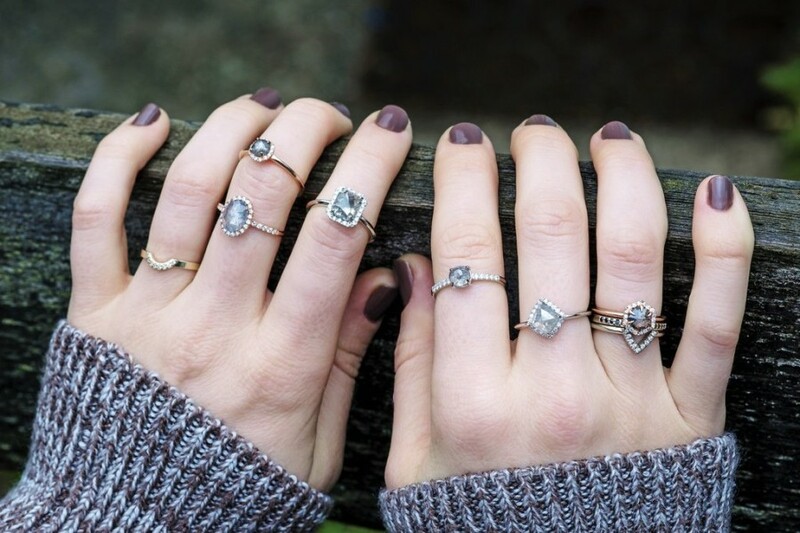 Then there are, of course, gray diamond engagement rings. There was once a time – not so long ago – when it was almost assumed that an engagement diamond ‘should’ be a traditional clear diamond. Recently though fancy colored diamond engagement rings have become more and more popular. Today’s bride often values individuality in every aspect of the nuptials, and that included her engagement ring. And as gray is such a striking choice it is becoming a favorite among those who are looking for something truly different that they can make their own.